The Palais Idéal is among the best known art environments in the world. 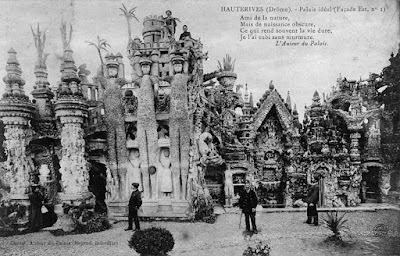 It is quite possible this creation inspired other outsiders (in France and elsewhere) to make their creations and it is quite sure that it aroused the interest of mainstream artists and writers (like André Breton, who discovered the Palais in 1931). Born in 1836 in a small village near Hauterives, Joseph Ferdinand Cheval lost his mother when he was 11 and his father when he was 18. He just had some years of primary education and did not have to be in a military service, possibly because of his small size. In 1856, twenty years old, he started working as a baker. In 1858 he married Rosalie Revol. In 1864 the couple got a son who died after a year. A year later a second son was born. In 1867 Cheval exchanged the baker's trade for a job at the French national post service, first working in places outside of Hauterives. In 1873 his wife Rosalie died. In 1878 Cheval was stationed in Hauterives as post deliverer, distributing the post to the inhabitants of his district, making a daily walk of 32 kilometers. In the same year he met Claire-Philomène Richaud to whom he got married for the second time. 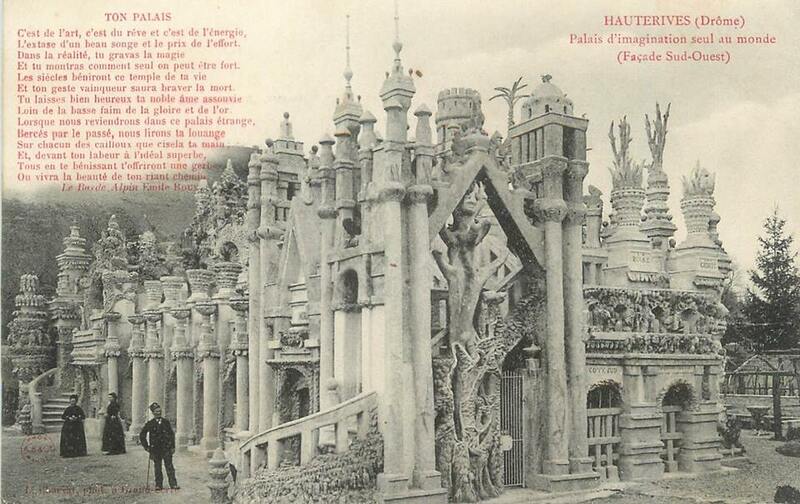 The story has been told many times: in 1879, on an April day, doing his 32 km Cheval stumbled upon a rock, was surprised by its form and got the idea to realise the dream he sometimes had during his post distributing tours: to create a beautiful building. In October 1879 a daughter was born, named Alice. She would die in 1894 at age 15, one more tragic event in Cheval's life. 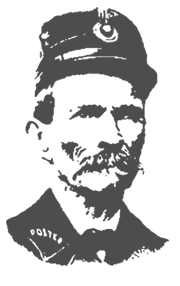 Cheval got retired in 1896 at age 60. His wife would die in 1914. His second son died in 1922. Cheval himself died in 1924. 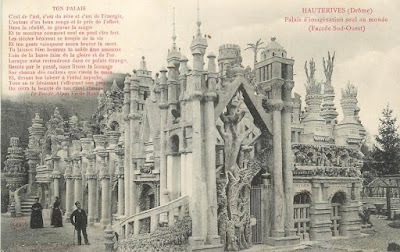 Starting in 1879, when in his early forties, Cheval continued this creative activity for 33 years, working all by himself, often in the evening or in the night, just using simple utensils. During the first twenty years, his project only became known to the local residents, who probably viewed Cheval's activities with some surprise. Only after those years, in the beginning of the new century, his activities became more widely known, with in 1905 a first article in the national magazine La Vie Illustrée. 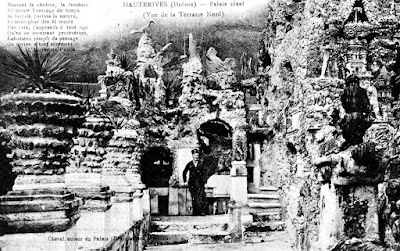 The eastern facade of the Palais includes an Egyptian monument and a Hindu temple and there are three rising sculptures depicting Caesar, Vercingetorix and Archimedes. The western facade has -separated by pillars- a number of niches in which there are miniature monuments from various cultures, it also has some balustrades accessible via staircases, and there is a replica of a mosque. 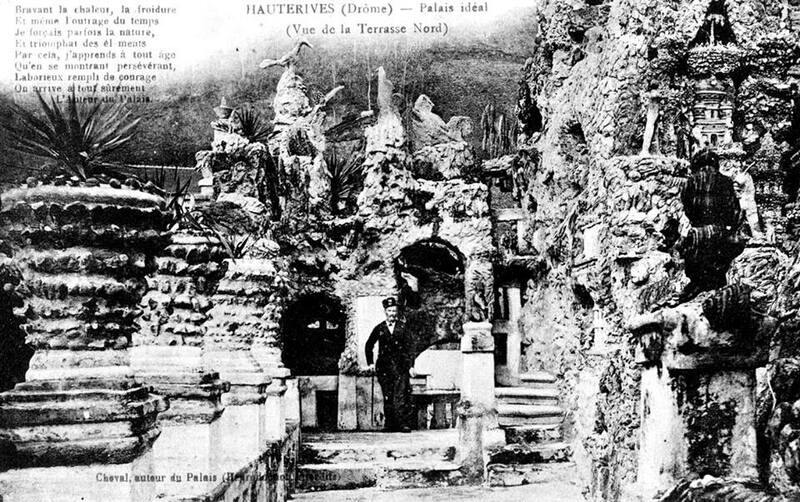 The northern and southern side of the Palais have terraces, columns and all kinds of structures that somehow refer to a variety of cultures and civilizations. 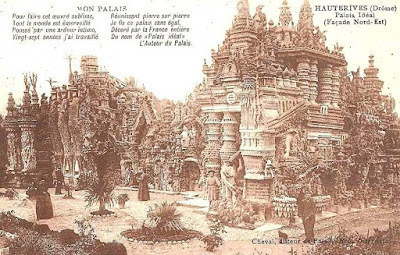 In 1912 Cheval considered his project as completed: it had resulted in a singular arhitecture 26 m (85 ft) wide, 14 m (46 ft) deep and between 8 and 10 m (26/33 ft) high. 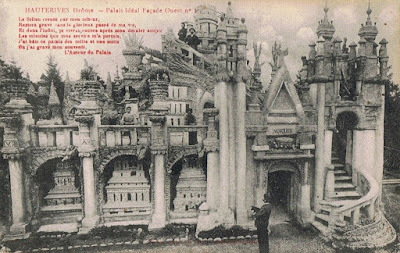 Cheval had indicated that he wanted to be buried in his Palais, but the authorities would not allow this. 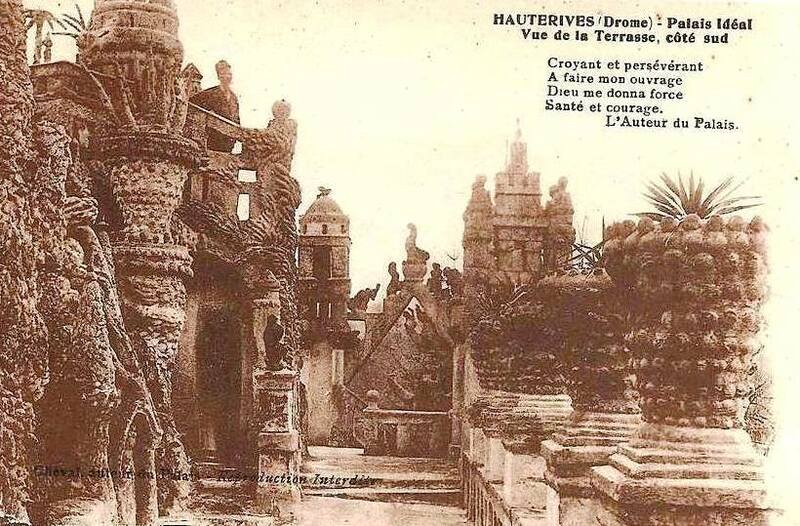 So, starting in 1914, on the local cemetery he also constructed a tomb, which took him some eight years to complete. He has been buried there after he died in 1924. In the 1930's Cheval's creation was discovered and discussed with admiration by artists such as Andre Breton and Picasso. But it took some time before official France acknowledged the importance of Cheval´s achievement. 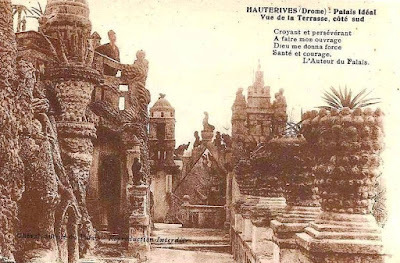 However, despite strong opposition, in 1969 France's Culture Minister formally declared that the site was a Monument Historique, which also implied it got a protected status. It took some more time before the french national Postal Service did honor facteur Cheval, but in 1984 a stamp with his image was issued and in 2007 an exposition in the national Musée de la Poste in Paris was organised that featured him an his creation. 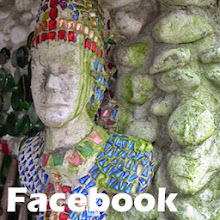 Owned by the city of Hauterives since 1994, the site attracts over a 100.000 visitors a year. It can be visited (almost) daily the year round. The internet has a lot of information about the Palais Idéal. * A video (uploaded jan 2010 to You Tube), made by the Moscow Museum of Outsider Art (russian spoken).